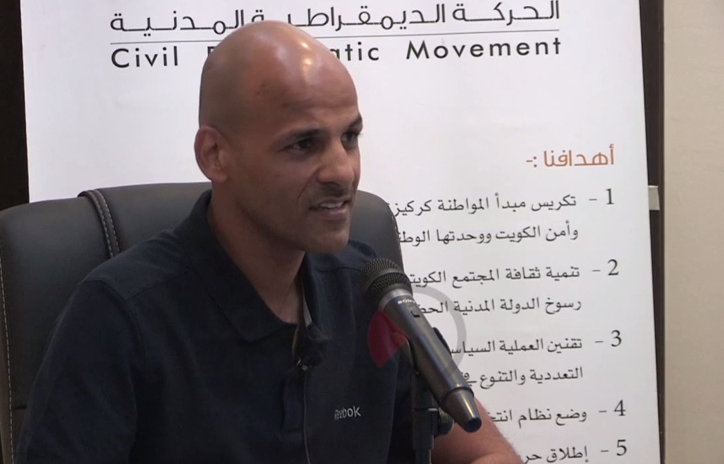 Abdulhakim Al-Fadhli, 41 years old, is a prominent defender of Bedoon rights in Kuwait, who became an active human rights defender in 2011. He studied English literature and business management at the Arab Open University but left his studies as he was targeted on several occasions due to his peaceful and legitimate human rights activities. He used his knowledge of English language to communicate with international mechanisms, including the United Nations. In order to earn a living, he worked as a machine repair person, but was suspended from work in May 2012 because of his human rights activities. Since 2011 he was imprisoned 13 times. Al-Fadhli has spent the last few years being repeatedly arrested and detained on a number of cases, and has been tortured in detention. Among his punishments, he was ordered to be deported from Kuwait. Most recently, he was released from prison on 01 August 2017 on bail of 500 Kuwait Dinars (approx. USD$1650) after serving a one-year sentence related to peaceful protests. He had been detained at the Central Prison in Kuwait since 26 September 2016 after he voluntarily surrendered himself. Prior to his release, he was forced to sign a declaration that he wouldn’t participate in any further protests in exchange for freezing both the deportation order issued against him and another prison sentence. On 16 February 2017, the Court of Cassation suspended a two-year prison sentence, set bail at 500 Kuwait Dinars, and ordered him to sign a judicial declaration that he won’t protest any more. The sentence of the Cassation Court is related to a peaceful protest that took place in 2012 to defend the rights of the Bedoon community in which Al-Fadhli was involved. Al-Fadhli spent 56 days in detention in relation to the same case from 19 April to 14 June 2016 which was deducted from the one-year sentence. On 14 June 2016, the Court of Cassation ruled that it would convert the first of several cases against him (in which he was accused of calling for a gathering) from a felony to a misdemeanor. As a result, the one-year sentence was suspended, and the court ordered him to be released pending review of his case by the Misdemeanors Appeals Court at a hearing on 20 September 2016. However, Al-Fadhli was not released from prison until 02 August 2016, after serving a three-month sentence issued on 23 February 2016 on a charge of alleged misuse of the phone related to his participation in a peaceful demonstration on 02 October 2013. Then on 20 September 2016, the judge of the Misdemeanors Appeal Court rejected Al-Fadhli’s appeal of his sentence. The judge confirmed the sentence of one year in prison with labour, to be followed by deportation from Kuwait, which was originally handed down on 16 May 2016. Al-Fadhli went on hunger strike 14 times during six years of imprisonment. Some of these strikes lasted up to 55 days. He has undertaken four hunger strikes while in the Central Prison to protest his arrest and ill-treatment. The last hunger strike started on 02 March 2017 and only ended on 25 May 2017. It’s worth mentioning that the hunger strikes have had a serious impact on his health in general. Prior to Abdulhakim Al-Fadhli, the “Supporting Human Rights Defenders and Freedom of Expression” campaign, which was launched last February, chose prominent human rights defender and brave Tunisian journalist Naziha Rjiba (Om Zied) as the defender of the month of February; then prominent human rights defender and blogger Ahmed Mansour from the United Arab Emirates, who was arbitrarily arrested as the defender of human rights and freedom of expression for March; followed by prominent human rights lawyer Gamal Eid from Egypt for April; prominent human rights defender Hanaa Edwar from Iraq for May; the three journalists of the Omani newspaper “Azamn”, Ibrahim Al-Maamari, Yousef Al-Haj and Zaher Al-Abri, as the defenders of human rights and freedom of expression for June; Moroccan human rights defender and journalist Ali Anouzla for July; Palestinian rights defender Jamil Dakwar for August; prominent human rights activist Wadad Halawani from Lebanon for September; prominent human rights defender Radhya Al-Mutawakel from Yemen for October 2017; and prominent human rights defender Madawi Ibrahim Adam from Sudan for November 2017.